Detox Red Lentil Soup is high- fiber, vegan, vegetarian, dairy- free and gluten- free. 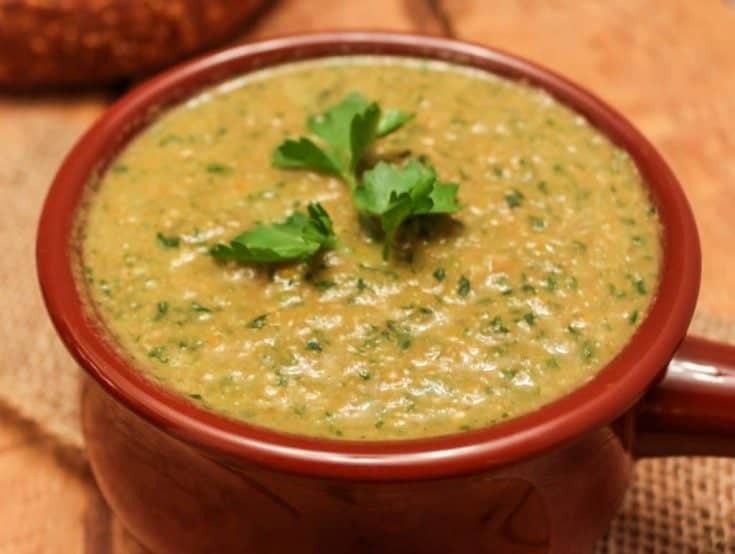 This luscious, healthy soup will flush out toxins while refreshing and nourishing your body. Be sure to take a look at our other healthy soups like Mung bean Curried soup and Cabbage patch Soup. Every year, after the big food holidays, Dave and I feel sluggish, and headachy… and fat. In fact, we have gained at least five pounds of holiday cheer. I hate it when nothing fits and I feel tired and cranky. Too many goodies of all the wrong kinds do that and more. In only a few weeks of overindulging too. Too much Pumpkin pie love here. Time to detox with healthy, high-fiber foods, like soups! Detox Lentil Soup is full of nutrients, and light of calories! Time to drink lots of water and rev up the metabolism so we can expunge the bad stuff stuck in our guts, and give the body a rest. Detox red lentil soup is a good soup anytime. Right now when we are clearing out the junk, it’s almost medicinal in its benefits for our bodies. The fiber in this soup will help clear out a digestive tract clogged with unhealthiness. It’s full of great nutrients too. We work on the 80-20 plan. Now healthy food and lifestyle is the 80 percent of our diet. Last week it was severely shy of the 20 percent. Winter gloom and rain is hard to get through around here. Going outside is yucky. Sitting in the nice comfy warm house and eating homemade cinnamon rolls seems like a really good idea. Healthy soups are a good addition to the diet. Lentils are amazingly good for you. So are the other ingredients in this lovely recipe. This is a high carb soup full of sustaining nutrients your body will love. If you purchase items from our affiliate links we may receive a small commission. Thank you for supporting Homemade Food Junkie. Enjoy this healthful soup whatever the time of year, or state of your health. But if you’re looking for a great way to give your body a boost; here is a humdinger! Place your lentils into a [easyazon_link identifier=”B00008CM6D” locale=”US” tag=”homefoodjunk-20″]3 quart pot[/easyazon_link]with 4 cups of water. Boil and reduce heat to simmer until tender but not mushy. Meanwhile, In a medium [easyazon_link identifier=”B00008CM6J” locale=”US” tag=”homefoodjunk-20″]stock pot[/easyazon_link]on medium heat, add hot sesame oil and sauté’ the chopped veggies along with all the other ingredients, except kale, fresh peppers and lentils. Sauté’ for 5-10 minutes. Add the kale and water to the mixture. Simmer a few minutes. Add the lentils and simmer until everything gets well incorporated. Blend the soup mixture and your raw peppers in your [easyazon_link identifier=”B00939FV8K” locale=”US” tag=”homefoodjunk-20″]blender[/easyazon_link] to a soup like consistency. When ready to serve, garnish with parsley. Serve in [easyazon_link identifier=”B013YS7PKM” locale=”US” tag=”homefoodjunk-20″]soup bowls[/easyazon_link]with tomatoes and avocado slices. This is a very healthy high- fiber, vegan, vegetarian, dairy- free and gluten- free soup. This luscious, healthy recipe will flush out toxins while refreshing and nourishing your body. Place your lentils into a 3 quart pot with 4 cups of water. Boil and reduce heat to simmer until tender but not mushy. In a medium stock pot on medium heat, add hot sesame oil and sauté' the chopped veggies along with all the other ingredients, except kale, fresh peppers and lentils. Sauté' for 5-10 minutes. Add the kale and water to the mixture. Simmer a few minutes. Add the lentils and simmer until everything gets well incorporated. Blend the soup mixture and your raw peppers in your blender to a soup like consistency. When ready to serve, garnish with parsley. Serve with tomatoes and avocado slices. The prep happens mostly at the same time as you cook this recipe. You will be busy in this hour. This soup is so worth it! I so love soup and this looks delicious -, so happy it’s soup season now! Thank you Debra. This is a warm cozy, healthy meal for our cooling weather! This looks great! I’m not much of a soup fan but I would attempt this. 🙂 Thanks for linking this up to Totally Terrific Tuesday last week! Hope to see you again this week! Thank you Sharon. I enjoyed the party and plan to attend! I had a great time looking at the other posts! Fantastic soup here, perfect to start the new year or new day. Thank you Dan and welcome to Homemade Food Junkie!